Δελτίο τύπου: «Welcome to Symetria. A metal band born in 2016 of musicians coming together to write what they've been waiting to hear. Twin shredders Kevin Cust and James Soto weave a sonic tapestry of complex and intertwined mastery while vocalist Vince Santonastaso grabs your attention and pulls you into the lyrics. Bassist Fernando Carrera brings the rumble and low end boom from the depths below and Blair Smith rages behind the drums to drive the sound with a thunderstorm's intensity and power that destroys everything in its path. Beautiful, humble, balanced, and intelligent, a perfect dream, is the definition pulled straight from the urban dictionary and translates clearly to what the band puts forth from the first note to the last. Symetria recorded their debut album in early 2017 and released it on September 29th. They immediately went all out and took the stage with Overkill and the rest of the Metal Alliance Tour the next day. The first concert review came in with a compliment stating that they played like they belonged on the bill. 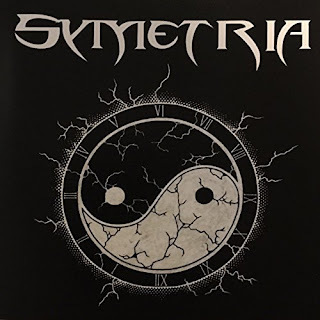 That set the tempo for the Symetria train and it hasn't slowed down one bit. The album was warmly received by critics and fans alike; interviews have helped to boost the exposure around the globe. From getting headliner slots at the local level to landing both FM and underground airplay and selling CD's all over the world they have set their sights to the highest heights possible and are determined to see them through.